Sony claim that the new Alpha 230, 330 and 380 models, will be “smaller, lighter, easier to use and offer innovative expansion options not found in other systems,” with prices running from $550, $650 and $850, respectively, with the SAL-1855 DT 18-55mm F/3.5-5.6 standard zoom lens thrown in. 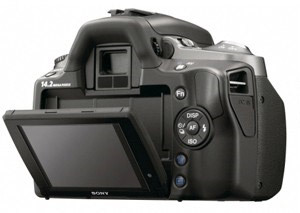 The 10.2 megapixel Alpha 230 camera claims to be the “lightest, most compact alpha DSLR camera body ever,” weighing in at just 15.9 ounces, with the other models also enjoying the benefits of a long stay at the fat farm, being considerably slimmed down from their predecessors. 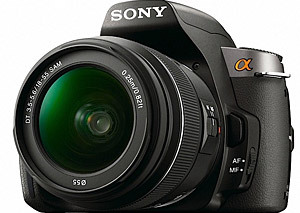 The 330 and 380 models come with Sony’s Quick Autofocus (AF) Live View technology for framing photos on the camera’s LCD screen, and all the cameras support SD/SDHC cards in addition to Sony’s Memory Stick format (which the company seems hellbent on inflicting on users for all eternity). All the cameras come with SteadyShot INSIDE in-camera image stabilisation to keep away the wobblies and a 2.7″ LCD screen plus optical viewfinder, with the 10.2 megapixel Alpha 330 and the 14.2 megapixel Alpha 380 sporting a natty articulated screen, with up or down movement for grabbing those creative angles. Notable by its absence, however, is any kind of video recording which is fast becoming the range the market and may be something to put off potential customers. In line with its first-time user demographic, the Alpha range comes with a built-in ‘Help Guide’ which serves up concise explanations of various modes and settings, with a graphical user interface casting light on the complexities of aperture and shutter speed settings. 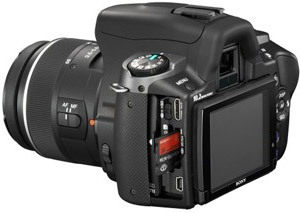 Pre-orders for the new cameras will begin today at www.sonystyle.com/retail and at selected retailers nationwide.